It’s day 3 on the Summer Solstice Sequels tour, where authors Fiona Paul (VENOM), Lili Peloquin (THE INNOCENTS), Jessica Spotswood (BORN WICKED), and Elizabeth Richards (BLACK CITY) have united forces to celebrate the launch of their upcoming sequels! Today we’re spotlighting Fiona’s new book, BELLADONNA (Secrets of the Eternal Rose, book #2), out on July 16! In the second in the stunning Secrets of the Eternal Rose series, Cassandra Caravello is trying to forget Falco, the wild artist who ran off with her heart, as she grows closer to her strong, steady fiancé, Luca. But Luca seems to have his own secrets. When he’s arrested by soldiers in the middle of the night, Cass’s life is once again thrown into chaos. She must save Luca, and that means finding the Book of the Eternal Rose—the only evidence that will prove he’s innocent. So begins her journey to Florence, a city haunted by whispers of vampirism, secret soirees and clandestine meetings of the Order of the Eternal Rose. And home to Falco, who is working for the Order’s eerily stunning leader, the Belladonna herself. Can Cass trust her heart to lead her to the truth this time? Fiona Paul lives in the Midwest but travels a lot since she can't breathe if she spends too much time away from the ocean. She graduated from Washington University in St. Louis with a major in psychology and spent a year teaching English in Seoul, Korea while she was deciding what she wanted to be when she grew up. Answer: everything. 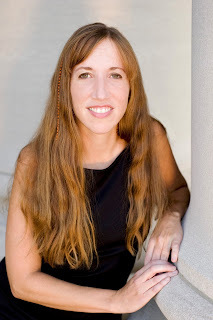 In addition to being a teacher and writer, she's also worked as a saute cook, sporting goods manager, veterinary assistant, and registered nurse. When she's not working, you can usually find her kayaking, reading, or helping turtles cross the road. Her future goals include diving with great white sharks and writing more books, not necessarily in that order. Venom is her first novel. GIVEAWAY 3: A ROOM WITH A VIEW! Each day the authors have come up with a fun quiz for you to play. Today’s game is A Room With A View! Elizabeth, Jessica, Fiona and Lili have each taken a photo of the view from their study. All you need to do is guess which view belongs to which author! We’ve given you a simple clue under each photo to help you out. FYI, Elizabeth Richards wrote PHOENIX; Jessica Spotswood wrote STAR CURSED; Fiona Paul wrote BELLADONNA; and Lili Peloquin wrote THIS SIDE OF JEALOUSY. Good luck! The contest will close at 12pm EST, June 28. Any entries after this date will not be counted. Winners will be notified by email. US only. Entrants must be over 13 years old. Entrants under that age must have a parent or guardian enter on their behalf. HINT: This view might make you green with…jealousy? 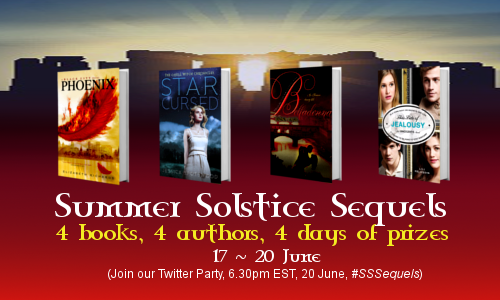 Jess, Liz, Lili and Fiona are throwing at Twitter party on Thursday June 20th, 6.30pm EST, #SSSequels to celebrate the launch of their books! They’ll be answering your questions and giving away LOADS of prizes, courtesy Penguin Teen, so you won’t want to miss out. See you there! Oooh. If I had view #3 I would get no work done ever! Thanks for being part of the #SSSequels Blog Tour, Jean! I have lived MANY LIVES for being not-horribly-old :) As one editor once told me "Lots of work/life experience is great training for being a writer." And yeah, I have just applied for some new nursing jobs now that I am done with my Masters and caught up on deadlines. I miss interacting with the patients :) Nurses rule! I am a devoted book lover and book reviewer for fictional books (YA + adult). My goal is to provide in-depth opinions on these books and be able to share thoughts and ideas with other book lovers.